Jon Jursich Raises Money for Hope Kids and Relentless by Lifting BIG Weights! 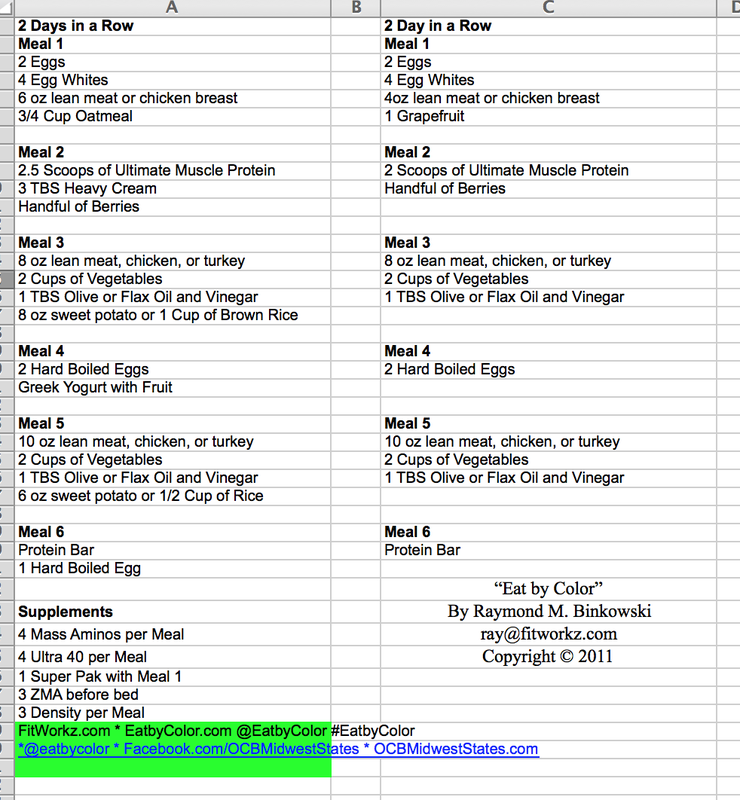 Eat by Color Elite Powerlifting client Jon Jursich nutrition, training and most importantly raising $$$ for kids for Hope Kids at Relentless. 100% of the money goes to the kids and families to cover expenses. Raymond M. Binkowski is the owner of FitWorkz a hybrid training gym in DeKalb, IL, author, and trainer. He has lost over 60 pounds and kept it off for over 15 years. Ray’s books Eat by Color, Get Fit and Live Healthy, and Exercise Galore can all be found on Amazon! 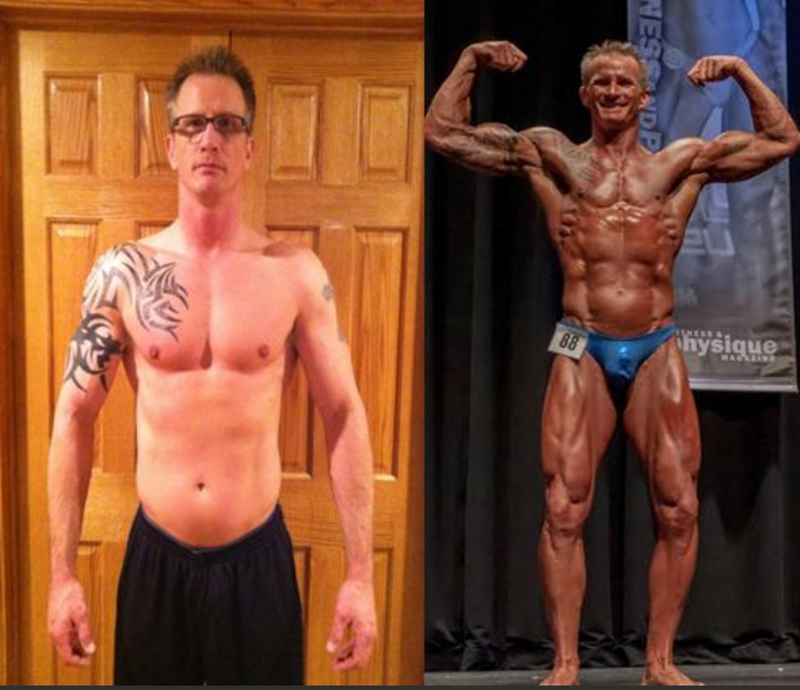 He has worked with thousands including professional athletes, police/fire/military, physique competitors, even 3M, and most often people looking to make a long term change in health, wellness, and weightloss. Plus the Get Fit and Live Healthy podcast. The podcast is FREE on Itunes. Yes You Can Lose Fat While Gaining Muscle, Best Advice for Working with a Trainer, and More! Yes You Can Lose Fat While Gaining Muscle, Best Advice for Working with a Trainer, and More! Yes you really can lose fat while gaining muscle and it does NOT take as much time as you think in the gym. We just featured Emily in a post. She has lost 12 lbs of fat while gaining 8 lbs of muscle. The best part she still had the occasional glass or two of white or red…as well as pizza. Plus she only spent about three hours a week exercising. Seriously three hours a week. That is it. 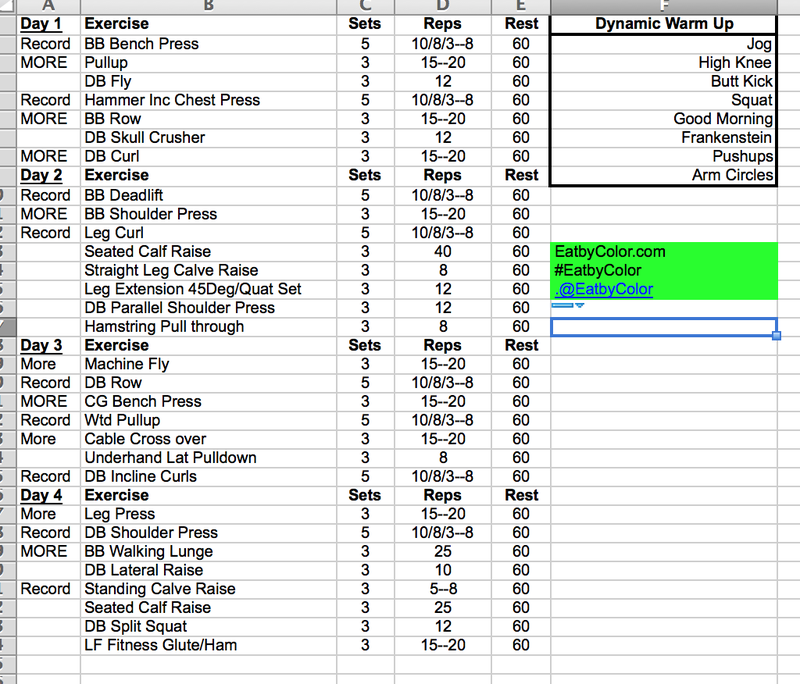 Emily follows Eat by Color and is using our affordable training app for her workouts. Not only does she has a plan, our training app allows her to record her sets, reps, and rest. Most importantly the app shoes her progress in each exercise…. Remember progress is very motivating. Want to learn more about our app or what Emily is doing we would love to hear from you! The best advice when working with a trainer. If you feel light headed, dizzy, nauseous, etc. STOP! Sit! and tell the trainer! Sipping a Gatorade will help alleviate the nausea. There is no working through these things and no million dollar contract for trying to. Raymond M. Binkowski is the owner of FitWorkz a hybrid training gym in DeKalb, IL, author, and trainer. He has lost over 60 pounds and kept it off for over 15 years. Ray’s books Eat by Color, Get Fit and Live Healthy, and Exercise Galore can all be found on Amazon! He has worked with thousands including professional athletes, police/fire/military, physique competitors, even 3M, and most often people looking to make a long term change in health, wellness, and weightloss. Plus the Get Fit and Live Healthy podcast. The podast is FREE on Itunes. Chad drops fat and gains muscle with no cardio with Eat by Color Elite. Interested in learning how Eat by Color can help you? Click here and then the FREE consult. Train in 3-D and make your Injuries go away. Are you an athlete? Not sure. Well in this case we are loosely going to define athlete as anyone that exercises regularly. More specifically as anyone that does the same type of exercises week in and week out. Bodybuilders, powerlifters, runners, cross fitters… you are definitely in this category. Training in 3-D means not doing the same old same old. Many of us fit in to one of the categories above. We do the same exercises over and over and over again. This is done in a very 1 dimensional manner. 3 dimensional means training outside of our norm. See the video above and tips below. PS>..would love to hear from you so post, comment or message us! Make sure you include variety in your trainer. Don’t just do the same machines and same cardio. Every two to three months take a week off. When you return do something fun for a few days then back to a normal routine. By fun, try some new exercises. If you normally hit the free weights try some machines. If cardio is your game on the treadmill try the rower. You get the idea try something different. If you put the miles in and run 5K/10K/13.1/26.2 make sure you include some time away from your next race. We see many train and run race after race after race. The result is chronic pain and in some cases having to give up running. To avoid this make sure you hit the weights as part of your training. Also pick a few fun races a year and leave them at that, forget the “it is just a 5K this weekend” which leads to a race every week or few weeks. We see many clients quit running, hit the weights and then run their BEST 5-10Ks. Add weights, take a break and back off on the race every weekend even if it is just a 5K. Back off on the volume. Changes the lifts and movement patterns. Take a week off completely every few months. We have seen drug free competitors make real progress by training for 8 weeks then taking 5-7 days off. Gains? 9 lbs of lean mass in 6 months and another client gained 16 lbs in a year on their contest weight. There is more than just the big three. Take some time away form the big lifts. Don’t do a meet every few months indefinitely. I worked with a 6 time USAPL drug free for life bench press champion a few years back. He would rock Nationals every August if and only if he did NOT do a meet in the first quarter of the calendar year. Every time he did a small local meet in the first part of the year he would bomb at nationals. Since he kept incredible training logs and meet records we could see this trend. Take time offer. Max reps for time of the same exercises often leads to overuse injuries. This is of course if you are in good enough shape to do the to begin with. Take time off and do some traditional weight training. Even hit some machines. Back off the oly lifts and their hybrids for a bit. Let your body rest. Take a week off. Interesting in learning how Eat by Color can help you? Click here an then the FREE consult. Eat by Color Portable Breakfast Egg Muffin Sandwich will make having breakfast on the way out the door easy! So this morning things were crazy at our house. Dogs have vet appointments, kids have kids stuff…the classic going in a million directions at once with little time to eat breakfast. Sound familiar??? Eat by Color Portable Breakfast Egg Muffin Sandwich solution. Cook the eggs… I cheated and put a lid on the frying pan so they would cook faster. The muffin toasted while the eggs cooked. When the eggs were done I used a cup to make a circle egg patty the size of the muffin. The cheese was placed on each piece of the muffin. The eggs were put on one muffin then the other half of the muffin was put on top making a sandwich. 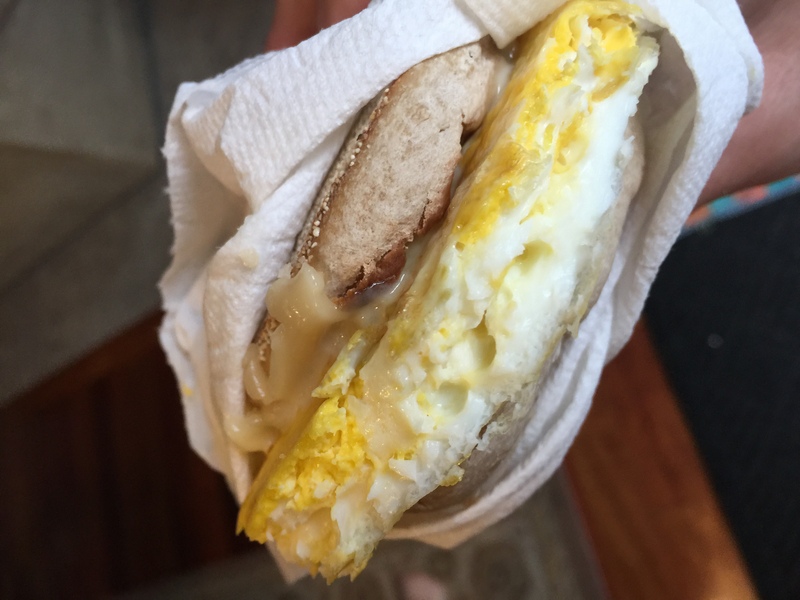 The Eat by Color Portable Breakfast Egg Muffin Sandwich was then placed into a folded paper towel. Done. Breakfast complete with napkin in minutes. NFL Quarterback and NIU Alum Chandler Harnish talks going to the next level with Eat by Color! Another outstanding athlete that has played at all levels all the way to the top…the NFL. Watch the video…parents, athletes, and coaches…watch the video you will take something away. If you are interested in getting recruited (Chandler talks about making DVDs and binders and sending them out), getting in the game (Chandler sat the first game of his Junior year,) overcoming injuries (training builds confidence), becoming a leader (even on the plays he was not in), or earning the start…he talks about how he did it. 4) Speed and Agility at a place like Sports Performance Speed and Agility is a must…training at school with the team is not enough. 7) Training not more sport specific work but training to get faster, be more agile produce more power, etc is a must. Playing more of your sport will not make this happen. Interested in learning how Eat by Color can help you? Click here to get a FREE consult. Local Athlete Alyssa Hemmerich Stopped in to Discuss FitWorkz Sports Performance and its Impact on Her College Sport Soccer! Alyssa is a Sycamore High School graduate that played soccer for UW-Stout as a freshman last year. She trained with FitWorkz in our Sports Performance program to get ready for her first year of college athletics. We do not always see athletes comment that the realized they had more confidence…but that is exactly what Alyssa mentions… watch the video for the full details. Athletes… you have to be doing the extra on a regular basis. Your competitors are. The right EXTRA is not more of your sport…. For an elite sports program, you need elite athletes. For elite athletes, you need the right training. At Fitworkz, we can offer athletes the opportunity to get ahead of the competition. With our sports performance training, we can personally train an athlete for his/her sport, and allow them to improve in their skills and overall strength, speed, and power. We have helped thousands of athletes so far, and can help yours too. The 6 week program allows athletes to come in up to 6 days a week*. If you are looking for ways improve your athletes, and eventually your team, this is it. -Get Fast and Reduce 40 yard dash time by .1-.2 seconds or more! For the younger, soon to be athletes, Fitworkz has an amazing Total Youth Conditioning program. Teaching kids proper mechanics and fundamentals for running, jumping, etc., and also having fun while doing it. Having good form and mechanics is crucial for lessening future injuries. For (time details) kids will be given a head start at the athletic world. *Some restrictions may apply see club for details. As a bonus, Just click to get our 100% FREE explosive core strength exercise program for Athletes! Tricks and Tips to Make Sure We Eat the Foods We Should Eat, Eat by Color. We all know we should eat our fruits and vegetables. The fact that they are good for us is readily accepted. The problem, even though we should eat them, if we buy them and still do not eat them we are better off not even buying them. The real trick is buying the fruits and vegetables we will actually eat. They have to be convenient and in many cases portable. Plus they can not go bad before we can eat them. We stopped by our local Hy-Vee in Sycamore Illinois and chatted with registered dietician Lisa Brandt about this very thing. Check out the video for some great tips, and tricks.